Every person has a past. I do. You do. Everyone does. By past, I mean things we have done at a previous point in our lives that cause regret and embarrassment, if not outright shame. It is that laundry list of attitudes, actions, and events you aren’t proud of. How do you view your past? Has it held you captive, fearfully awaiting punishment from God? Here’s the thing: it’s not just you. Everyone’s past is marked by, at least to some degree, foolish words, reckless decisions, and sinful acts. Everyone’s! Many would-be followers of Christ and even many Christians live with persistent, suffocating guilt. They question whether Christ will truly forgive them for what they have done. They feel they will never measure up spiritually, and thus are assigned to second-class Christian status. But nothing could be further from the truth. In fact, the apostle Paul’s life proves it. We know Paul as the man who wrote thirteen New Testament letters and traversed the Mediterranean region on three major missionary journeys. This mighty man of the faith planted numerous churches, won multitudes to faith in Christ, and laid the doctrinal foundation on which the church has ministered for nearly two millennia. The apostle Paul was a missionary-theologian unlike any other the world has ever known. But before we meet the Paul in Acts 9 where he encounters the risen Christ, is gloriously converted, and then commissioned as an apostle, we hear of him in Acts 7. This passage records one of the most diabolical scenes in all the Bible—the stoning of Stephen, the first martyr of the early church. In that setting, we find Paul, then known as Saul, holding the coats of the stone throwers, rooting them on. Then, overflowing with hatred and rage, Saul goes to Damascus to persecute even more Christians. On that roadway, the resurrected Christ appears to Saul, confronts him, and subsequently calls Saul to himself and commissions him into ministry. The Apostle Paul, perhaps the greatest Christian to ever live, was also the man with worst past. So what was Paul’s secret to overcoming his past? The key is that he looked forward to Christian service, not backward in guilt, shame, or regret. Paul testified, “But one thing I do: Forgetting what is behind and reaching forward to what is ahead, I pursue as my goal the prize promised by God’s heavenly call in Christ Jesus” (Phil. 3:13–14). However, there is also a difference—a massive difference— between overlooking your past and forgetting about it. Paul never overlooked his past. He wrote extensively about man’s sinfulness, including his own. So what does that mean for you and your past? View your sin as God views it: God has separated your sin as far as the east is from the west; he’s cast it into the sea of his forgetfulness. Remember, Jesus did not reluctantly accept Paul. On the contrary, he intentionally sought Paul and enlisted him into Christian service. Rejoice in God’s providence: Whatever your background, whatever your past, rejoice in God’s plan for your life. He led you by superintending your steps and bringing you to a point of conversion. His providence is always good, beyond improvement. Thus, he crafted your story, including your past, for his own, optimum glory. Own your testimony: Do not see your past as an embarrassing prologue to be buried, but as a glorious story to be leveraged for the kingdom. Remind people, as you remind yourself, that if God can save you, he can save anyone. Rejoice in the mire from which you were saved; celebrate publicly God’s goodness in your life. As you do, you’ll encourage others and embolden yourself. Friend, be encouraged. The grace of God overcomes your past and enables your growth in the future. I am looking forward to adding this book to my library. 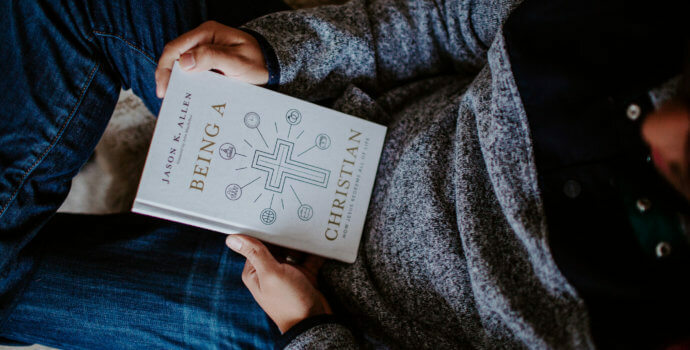 Dr. Allen has such clear insight into the Scriptures, & always has a way of explaining them in a way that anyone can understand what he is saying.